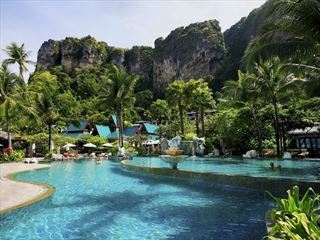 Phi Phi Island Village Beach Resort is a contemporary Thai-style resort enjoying a glorious beachfront location. 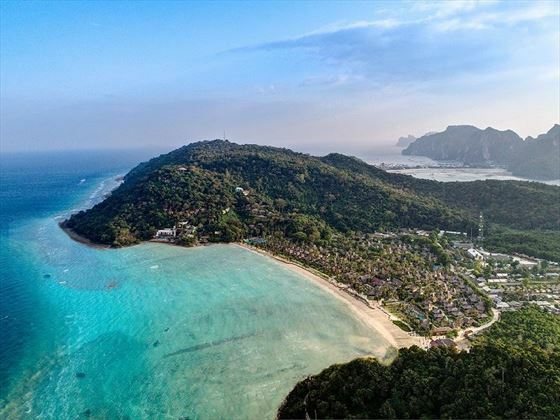 Sitting on the larger of the Phi Phi Islands, the resort is surrounded by undulating acres of tropical greenery and its own 800m private beachfront – a paradise for true relaxation. The secluded beachfront is the only one of its kind on Phi Phi Don, and one of the largest in Thailand. 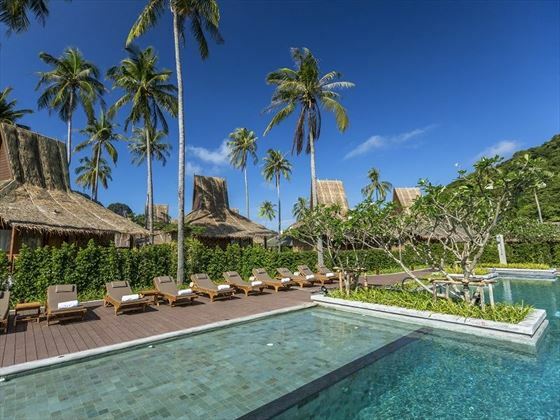 The thatched bungalow accommodations are either surrounded by lush gardens or enjoy a prime spot close to the quiet stretch of white sand beach at Loh Ba Gao Bay. A great choice for couples or honeymooners in search of secluded romance, the hotel also caters well to families with a dedicated children’s pool and waterslide. 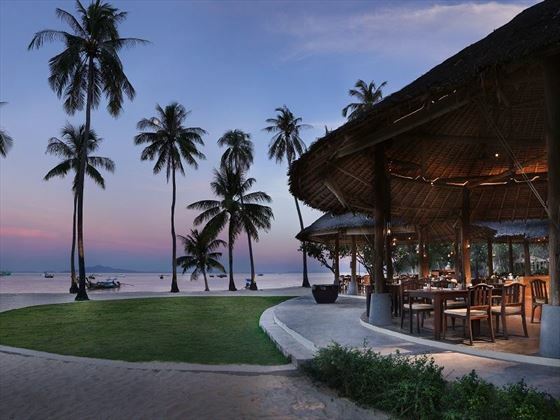 There are three great restaurants on site including the elegant Ruan Thai offering a romantic setting serving Thai specialities. And you won’t be stuck for things to do with a spa, a five-star PADI Dive Centre and a great range of watersports available. 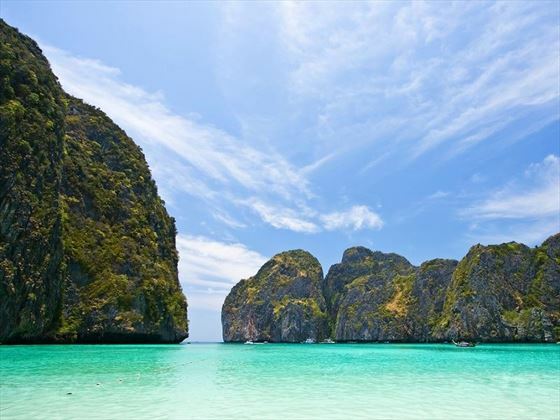 The resort is set on the eastern coast of Phi Phi Don, the larger of the Phi Phi Islands. 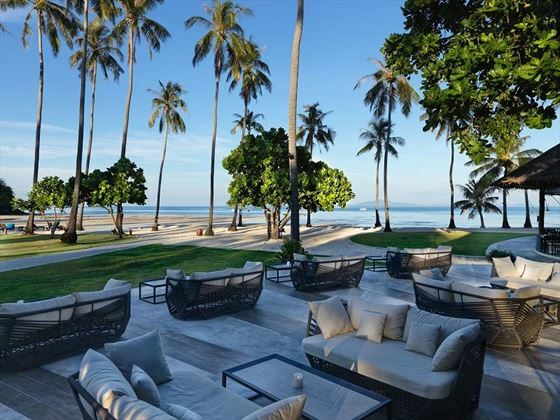 Blessed with a secluded, private 800 metre stretch of white sandy beach and turquoise waters, you can be assured that your getaway here will be idyllic and completely peaceful. There is always something to see or do on these pristine islands if you’re craving some adventure, from exploring beautiful walking trails to snorkelling and rock climbing. There are also shark watching tours that take place on the islands, where you can go on a snorkelling adventure under the clear seas with a professional guide and admire the fascinating marine life. Hop on to some exciting excursions to other islands, from Koh Phi Phi Leh, the second largest island, offering a national park and a completely picturesque beach, to Bamboo Island, a tropical paradise surrounded by a white strip of sand and lush vegetation in the centre, the perfect spot for a day trip with a small bar and unforgettable panoramas. Superior Bungalow – These charming 35sqm bungalows are located in the tropical gardens of the resort within easy reach of the facilities. Featuring one king bed or two twins (sleeps two adults and one child or three adults with rollaway bed available). 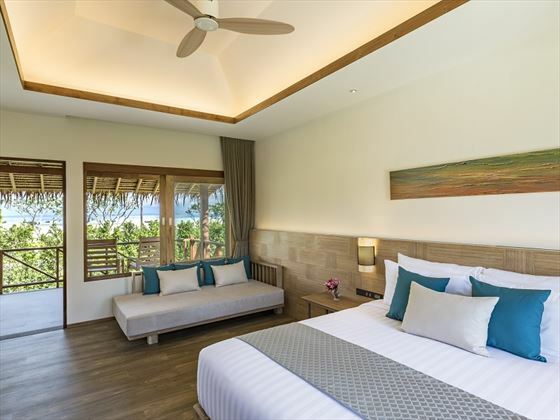 Deluxe Garden Bungalow – These rooms are larger than Superior Bungalows at 38sqm and have gorgeous, Thai inspired décor. (sleeps two adults and one child or three adults with rollaway bed available). Deluxe Bungalow – Located close to the beach, these large 59sqm bungalows are ideal for a more spacious stay (sleeps two adults and one child or three adults with rollaway bed available). 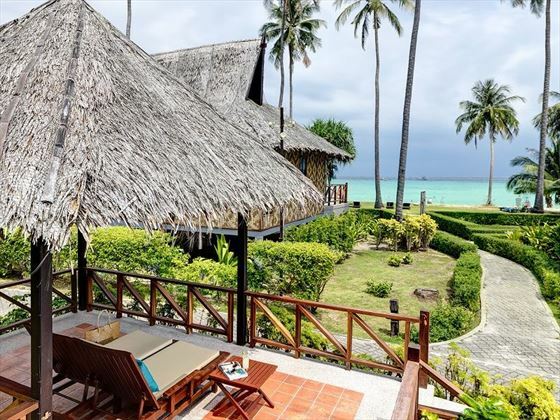 Deluxe Sea View Bungalow – 59sqm bungalows offering partial sea views and stylish, contemporary decor. (sleeps two adults and one child or three adults with rollaway bed available). Two Bedroom Family Bungalow - New, gorgeous 102sqm, two bedroom bungalows perfect for families. Features one king-size bedroom, and one twin bedroom for younger guests. (sleeps four adults and two children or five adults with a sofa bed in the King size room). Beachfront Junior Suite – Enjoying a prime location at the resort’s beachfront, the 79sqm Junior Suites are romantic and airy with a Jacuzzi, both indoor and outdoor showers and a living area. (sleeps two adults and one child or three adults with rollaway bed available). 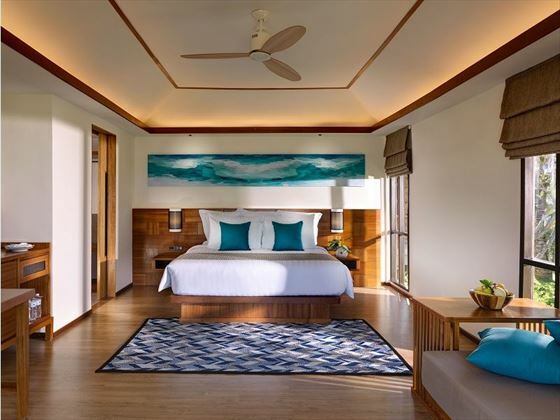 Hillside Pool Villa – These 110 sqm villas are the most luxurious accommodation on the property with a private pool and a large sundeck overlooking Lo-Ba-Gao Bay. Breakfast is available in room. (sleeps two adults and two children or three adults with a sofa bed and mattress available). Api Restaurant - A deliciously fresh restaurant serving authentic Asian and international cuisine, plus a cool Api Bar. Open 6.30am to 10.30pm, with cocktails available from 5pm-midnight. The Beach House Grill & Chill - Sitting right on the beach, this trendy restaurant offers delightful beach-inspired cuisine and live entertainment. Open 6pm-midnight, with cocktails served from 5pm. Co/Bean - An al fresco coffee cafe perfect for grabbing a hot drink or a homemade ice cream. Open 7am-10pm October to April, and 9am-10pm May to September. Pool Bar - There are two poolside bars offering refreshing cocktails and light snacks. Open 9am-6pm. 2 swimming pools, one with pool bar. The pool area has recently undergone a refurbishment to create a modern, trendy appearance. Snorkelling with colourful corals, tropical fish and exotic species including sharks, sea turtles, rays, octopuses, seahorses and many more. The hotel operates their own excursions to Maya Bay early in the morning, so guests can experience its gorgeous scenery before other tourists. Marine Discovery Centre - houses informative interactive displays and a special programme to re-introduce clownfish and bamboo sharks back into the regions waters. The resort has a children’s pool and a new Kids care programme, they will be able to take part in complimentary educational workshops with the Marine Discovery Centre's resident marine biologists. A babysitting service is available upon request (additional charge). Sorry, there are currently no prices available for your selected options. Please change your options or call us on 01342 310 571 for a quotation. 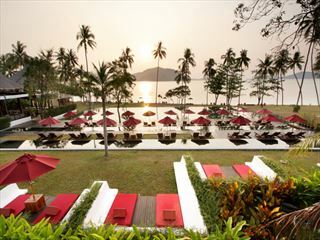 The Kata Thani is a deluxe beachfront hotel and spa situated on secluded Kata Noi Bay, on the southwest coast of Phuket Island, less than an hour from the airport. 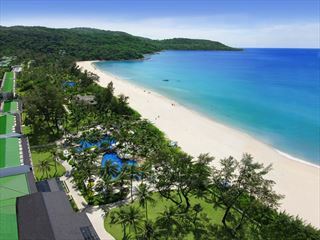 It is set on an unspoilt white sandy beach and surrounded by lush green hills. 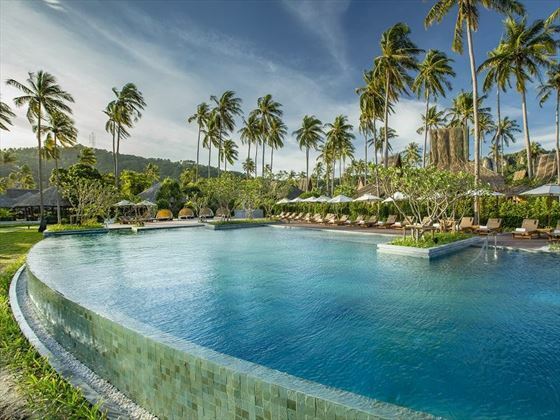 Enveloped by stunning tropical scenery, the Vijitt Resort Phuket is a sophisticated property with sensational vistas, attentive staff and luxury amenities. Ideal for couples seeking a romantic honeymoon spot or a secluded couples escape.